To understand this story I would like to give a short introduction on how the vedic study and hinduism evolved. After years of intense instruction on existing philosophy, if one chooses they can propound new philosophy. But they have to defend their thesis with existing theologist and philosophers by seeking “vaada bhiksha”(Seeking to debate). Upon convincing the theologist the new philosophy gets accepted into vedic theology or hinduism as we know it today. Thus hinduism is a way of life which underwent several centuries of refinement and sophistication. The house in which even the parrots and mynas discuss vedas and vedantas. 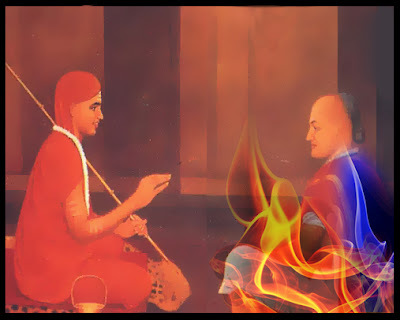 As Sankara reached his house it was the day of shraardha in Mandana’s house and it is considered inauspicious to see a sanyasi that day and Mandana was very rude to Adi Sankara to which Adi Sankara gave cryptic answers. The elders in the surrounding understood the intelligence that Sankara beheld and convinced Mandana to accept the request for vaada bhiksha. The following day Mandana and Sankara debate with Mandana’s wife Ubhaya Bharati as moderator. After several days of debate while mandana was losing the debate Ubhaya Bharati proposed that they should discuss kama saastra. Since he was sanyasi he never experienced it so he had to transcend his body and experience it in a kings body and won Mandana Misra over and took him and his wife as a disciple and he became one of the four main disciples of Adi Sankara.